The Academy of Nutrition and Dietetics defines resistant starch as a starch that escapes digestion in the small intestine and enters the colon unaltered. This is what makes resistant starch beneficial to your health. Upon entering the colon, resistant starch is fermented, which aids in a range of health benefits, from reducing diarrhea symptoms to increasing uptake of calcium and other minerals according to the academy. 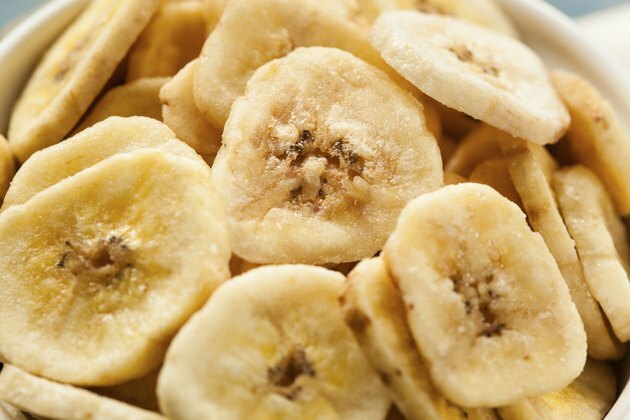 In a study conducted on the intake of resistant starch in America, researchers found banana and plantain consumption accounted for 14 percent of participants' intake of resistant starch. A large raw banana will provide you with 5.44 grams of resistant starch, while a 1-cup serving of cooked mashed plantains contains 7 grams of resistant starch. Foods classified as "breads" contribute the most intake of resistant starch to the American diet, according to a study published by the academy in 2008. Bread consumption accounts for 21 percent of America's intake of resistant starch. Among bread products, pumpernickel bread contains the most resistant starch, with 1.17 grams for one regular slice. Italian bread was also found to be high in resistant starch, with 1.14 grams in one large slice. Rolled oats have one of the highest resistant starch contents, with 11.3 grams per 100-gram serving. Puffed wheat, rice square cereal, corn flakes and muesli are other cereals with high resistant starch contents. According to academy, cereals and pasta contribute around 19 percent of the total resistant starch intake in America. Vegetables accounted for 19 percent of America's intake of resistant starch, according to the study published in the academy journal. Green peas, lima beans, boiled potatoes, fried potatoes and yams contain the highest amount of resistant starch. One boiled potato contains 1.8 grams of resistant starch. Legumes, also good source, contributed around 9.2 percent of resistant starch consumed in America. White beans have the highest amount of resistant starch, followed by lentils, mature peas, chickpeas and kidney beans.